The Princess and The Pump: A Type 1 Diabetes Blog: Feeling Lucky? Lucky to be part of a community filled with compassionate and caring people. Lucky to be able to DO SOMETHING to make a difference. Lucky that I'm not alone. Lucky that my child has access to the medicine and treatments she needs in order to live a very full life with diabetes. We are so very lucky. We are so very blessed. Because as I watched this and I read status update after tweet after blog, I just couldn't help but think of those who are not so lucky. Did you know that in some parts of the world diabetes is still considered a death sentence? 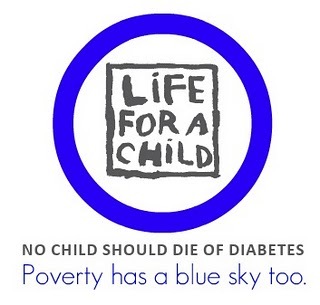 In developing countries many children and adolescents with diabetes die very quickly. I often think about how lucky we are to be living in this century because of all the advancements in treatment. The thought there are still dying of diabetes due to lack of treatment is sobering. It makes me sick. Don't get me wrong... I know there are people living in this country that are in desperate need of medical help. I know that there are people who desperately need supplies and help with treatment. I have not forgotten them. This also makes me ill.
And don't think I'm not focused on a CURE. Because I am. I want a cure badly. I also want new and better treatments. And I want it now. I get irritated that devices are available in Europe while we wait on the FDA. When it comes to my daughters health, I have little patience. So we support JDRF. We walk for a CURE. We raise thousands and thousands of dollars. We advocate. We talk to Congress. But today I felt it laid on my heart that this alone is not enough. Because NO ONE should die from diabetes. NO ONE. Your mortality should not depend on where you live. There are mothers out there who are holding their babies, just like I did a few years ago. Their very sick babies who lay lethargically in their mother's arms. Those children deserve access to medical treatments and care. Those children deserve to live. It's time to take action. And help globally. Participate in THE BIG BLUE TEST! "The Big Blue Test is a diabetes awareness program started by the nonprofit Diabetes Hands Foundation, that takes place every November leading up to World Diabetes Day on Nov. 14. The campaign reinforces the importance of exercise in managing diabetes. People with diabetes are encouraged to do the Big Blue Test any day between November 1 and November 14 at midnight Pacific Time, by testing their blood sugar, getting active, testing again, and sharing the results online at bigbluetest.org. In the last two years, just 14 minutes of exercise decreased participants’ blood sugar level between 15 and 20 percent. In 2010, more than 2,000 people did the Big Blue Test. Over 120,000 people watched the Big Blue Test video. Roche Diabetes Care, makers of ACCU-CHEK® diabetes products and services, funded the production of the video and helped it go viral by donating 75 cents for each of the first 100,000 views, resulting in total donation of $75,000. The donation provided insulin and supplies to more than 2,000 people with diabetes in developing countries. Now watch this video to get even more inspired! You can also support LIFE FOR A CHILD directly. "The International Diabetes Federation’s Life for a Child Programme is an international aid program that provides life-saving support to children with diabetes in developing countries. The Programme works with established diabetes centres in these countries so they can provide medical supplies, clinical treatment and diabetes education to the children and youth in their care. I hope that some of these words have touched your heart like they have touched mine. We are one community. We are in this together. And we have one united goal. It's up to us to make a difference. Not just for our children. But for children and adults around the world. Thanks for all you do to spread diabetes awareness Hallie!